← Do you really love me? These days in America, nobody likes the government. Nothing gets passed, there’s always childish bickering, everything seems rigged, etc. Much of this results from the extreme gridlock we have today between Democrats and Republicans– with few exceptions, neither side basically wants to compromise practically anything. An article from The Atlantic blamed all this gridlock on the Constitution itself, noting how our system of checks and balances is so strong that one branch of the government can prevent the other from governing. Included is the fact American politicians so strongly believe in this system that it compels them to take strong stances. Although true, much of the blame should not lie on the Constitution. Its system of check and balances is essential and has proven to work smoothly before. Neither should all of the blame be heaped on the politicians themselves who have refused to compromise. There is one factor that the article didn’t emphasize. The people. Yes, it’s the people’s fault. The Civil War. One of the most divisive periods of American history. What was said is probably counter intuitive to the usual political culture where politicians keep on praising how wonderful the people are and how bad the government is. But the truth is, a divided government reflects a divided people, not the other way around. Think back to before the Civil War. One side wanted slavery; the other didn’t. All those compromises between politicians, such as the Missouri Compromise and the Compromise of 1850, didn’t work at all. Why? Because no matter how many “across-the-aisle” bills politicians pass, if the people themselves don’t compromise, conflict is inevitable. The situation today goes along the same lines, where the present political climate has never been this polarized since the Civil War. The Republicans (especially the Tea Party) and Democrats have not budged a bit, even getting the government into shutdowns over issues such as healthcare and more recently, a possible shutdown just over Planned Parenthood. None of these issues are significant enough to warrant such disasters. Yet why is this so? Because the people themselves are polarized. Why do the Tea Party Republicans keep on getting re-elected despite never compromising? Because the people they represent like that– in fact, those people think they aren’t hard enough on Obama. And to be fair, those politicians are dong their job– representing the people accurately. This isn’t just the GOP but also the Democrats, too. 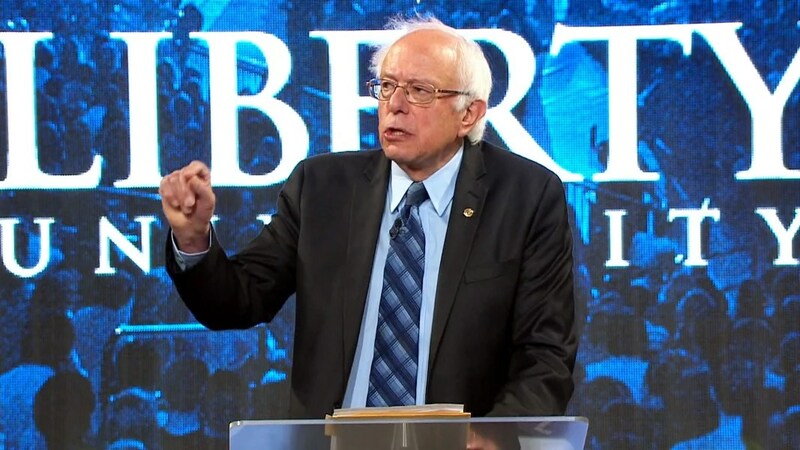 Bernie Sanders at Liberty Univ. Image from NBC. Of course, it is inevitable that the people in America have diverse points of views. Yet there are always a few issues, probably even more important than the ones that divide citizens, that both liberals and conservatives can agree on. Both sides are tired with establishment politics. Both sides are tired of money influencing elections. Both sides hopefully want to get rid of institutional racism. And so on. Our political culture now emphasizes on issues that polarize us. That has got to change. One of the 2016 candidates, Bernie Sanders, realizes this. He, a self-proclaimed socialist, recently went to and spoke at Liberty University, one of the most conservative places in America. And his reason for this was simple– “It is easy to go out to talk to people who agree with you… But it is harder, but not less important, to communicate with those who do not agree with us.” That’s precisely it. Sure, the politicians can claim that they’ve reached out to other politicians from different parties. But what matters more is if one reaches out to the people of the other party and strike a deal with them. To focus on what unites the people, so things that need to get done can be done. And when the people are united, so will the government. Hopefully, that day comes soon. Hey Titus, I’m an admirer of your writing, and I found your article regarding politics very agreeable. Just out of curiosity, which presidential candidate do you support and why? (I’m assuming Bernie Sanders because of the picture, but maybe I’m wrong). Yes I support Bernie, the main reason being he’s uncorrupted by Wall Street and a lot of his ideals align with mine. Thanks for reading. I am a writer and artist by heart, writing rap lyrics to poems. I have grand visions, and I aim to change society via the pen, via art. To Asian-American Students: Be Less "Asian"